Ideally situated just steps away from Spring Brook’s clubhouse, this log sided six bedroom, four bath chalet home has two levels in addition to a beautifully finished basement complete with family/game room. The exterior features a spacious wrap around deck, gas grill and a cement patio fire pit just steps from the home. 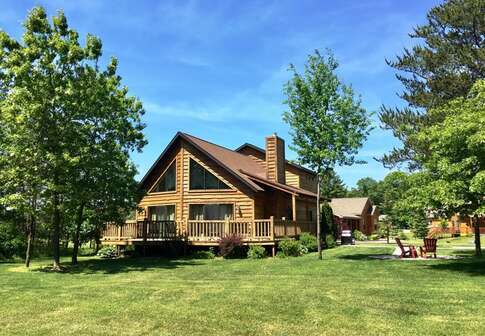 Perfect for golfers’ weekend, large family or corporate gatherings, the Red Oak Lodge sleeps a maximum of 14 people. The lovely interior carries a Northwoods theme and provides open concept common areas. The main floor offers a master bedroom with king bed and an en suite bathroom with a jetted tub. The roomy kitchen is well stocked, comes with full size appliances including a dishwasher and opens up to the dining and living rooms where guests will be swept away by the knotty pine cathedral ceilings. In addition to breakfast bar seating, the dining table sits up to eight guests for everything from a casual breakfast to a holiday dinner. Ample counter space and cabinetry provide storage and prep area. A gas fireplace and mounted flat screen which can be viewed from the kitchen add to the amenities offered in the guest friendly common areas. For privacy and added space, head upstairs where two more bedrooms, a full bathroom and a loft with a daybed are perched. The loft is furnished and makes a great nook for reading or relaxing. Bring your E-reader and devices as complimentary WIFI is provided. The bedrooms are each equipped with a queen bed. Bring on the sports fun because this home’s lower level has what it takes to accommodate everything from fantasy draft to football Sunday. The lower level boasts a beautifully finished family room with cozy furniture including a sectional sofa sleeper, big screen TV, and a classic arcade game. A ping pong table and wet bar with mini fridge offer additional entertainment amenities. For overnight guests, there are three additional bedrooms with yet another full bathroom to accommodate the occupants of the lower level without walking upstairs. The first two bedrooms have a queen size bed while the third is equipped with a queen size bunk bed. A basement utility room with washer and dryer is also available for guest use. The Red Oak Lodge sits in Badger Court within view of the golf course and is in close proximity to Spring Brook’s Clubhouse, which is home to the Spring Brook Sports Bar & Grill, indoor/outdoor pools, fitness room, golf course and pro shop. Home sleeps maximum of 14, rates based on 12 people over the age of 3. Extra guest fee of $15/night per additional guest applies. Security Deposit of $500 required.